We are very happy to announce a new feature, called Theater Comments, that has been added to every active theater in The BigScreen Cinema Guide! Was the picture in focus? Was there an excessive amount of the picture projected onto the masking material? How did the movie sound? Were all the channels working? Did it cut out from time to time? Did you feel welcome? Did the staff smile and seem happy to see you? If you had any questions or concerns, were they handled to your satisfaction? Were the bathrooms clean? Was there ripped carpeting or broken seats that haven't been fixed? Did the exterior of the building and the parking lot seem inviting? How was your overall movie-going experience? Did the movie start on time, or were there lots of commercials and/or delays? Our hope is that this will give our readers a voice about their experiences when going to the movies, and to provide our readers with valuable information about they can expect when attending a movie theater. A free-form comment area also provides a way to expand upon the areas above, to talk about how much time there was between the advertised start time and when the movie really started, and any other useful information that they would like to convey to other readers. 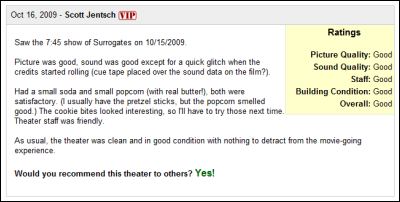 Theater Comments are part of the information we provide for every theater, so to find them for any theater, just find that theater in The Marquee, and click on "Reader Comments" in the sidebar. To make this feature valuable, we need to hear from you! Please take a few moments and leave comments about theaters that you've attended recently. It's easy to do, and over time, the collected information will be a great resource for everyone involved. We've developed this feature to provide value, so overly non-constructive comments and bashing is not welcome. It's just noise that provides little to no value to anyone. We're hoping that this will be a feature that highlights the best theaters and also identifies those theaters that need to improve a little bit to deliver the best possible movie-going experience. Updated October 23, 2009: Based on feedback, we added an "OK" rating to the scales. Went to Warrenton theater on firday night to see Snow White and the Huntsman...The theater we were in was very dirty..Popcorn thrown all over the floor..empty boxes on the floor, paper etc..Never have seen it like this before..It has always been very clean...hope this is not a regular thing!